It was a privilege and honor for me to have a friendly and professional relationship with President George H.W. Bush. I found him to be an extraordinary man of love, values, principles, standards, honesty, compassion, loyalty, camaraderie and character. Many have said that he was the most experienced person to ever become President of the United States. It would be difficult to challenge that assertion when considering that he served as a Congressman from Texas, C.I.A. Director, Ambassador to the United Nations, Diplomatic Envoy to China, and Vice President, before becoming President of the United States. He believed strongly in service to his country, beginning by volunteering for the U.S. Navy at the age of 18. While serving, he became the youngest Navy combat pilot and was actually shot down during a mission in WWII. Signed Executive Order 12677, which directed 27 agencies to increase the opportunities for the participation of HBCUs in federal programs. Increases in total funding over the fiscal years 1989 award levels were reported by most of these agencies. HBCUs received a total of $776 million in fiscal year 1989 and $894 million in fiscal year 1990, an increase of $118 million. Under the Bush Administration, Hampton University alone received unparalleled support for strengthening its programs and improving its facilities. Under the Title III Program alone, salary supplements, scholarship support and the acquisition of instructional and research equipment were received. 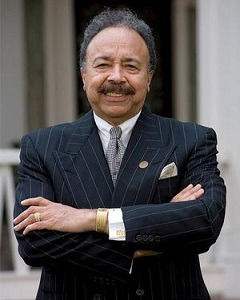 Dr. William R. Harvey is the president of Hampton University. *This article was originally published in the Daily Press.